I bought a huge (I bought mine at costco, but this gives you an idea) box of Frito Lay "healthy" chips. 30 bags of chips . . . yum! Baked Lays, Baked Cheddar & Sour Cream Ruffles, Baked Doritos . 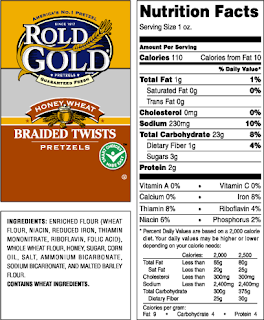 . . and Rold Gold Honey Wheat Twists (pretzels). Usually, I do not like pretzels, so the bags the twists where the last ones in the box. But, when I tried them, oh so yummy! You have got to try these. And there are a lot of them in the bag. I want to go get another bag of these right now. There are so many things I love . . .